If you’ve recently reviewed your business credit report, you may have noticed a UCC filing on your report. There are several important factors you need to take into account when it comes to acquiring a business loan and improving your business credit. One of those factors is becoming aware of any UCC filed on your business, understanding what they are, and how they can affect your business and ability to receive business lines of credit or other types of small business loans. Below, we’ll dive deep into what a UCC filing is, why it matters for your business, and how to remove a UCC filing if you find one on your report that shouldn’t be there. UCC stands for Uniform Commercial Code, which refers to a collection of U.S. policies designed to bring uniformity to aspects of commercial transactions across all 50 states. A UCC filing, or UCC lien, is a part of that collection of laws that refers to a kind of temporary claim which a lender may place on certain assets. When you borrow from a lender, they may decide to place a UCC-1 lien on your property and, in exchange, provide you with a loan of an equivalent value. A UCC-1 lien then serves as a way for lenders to claim collateral in case a business or individual isn’t able to pay a debt. 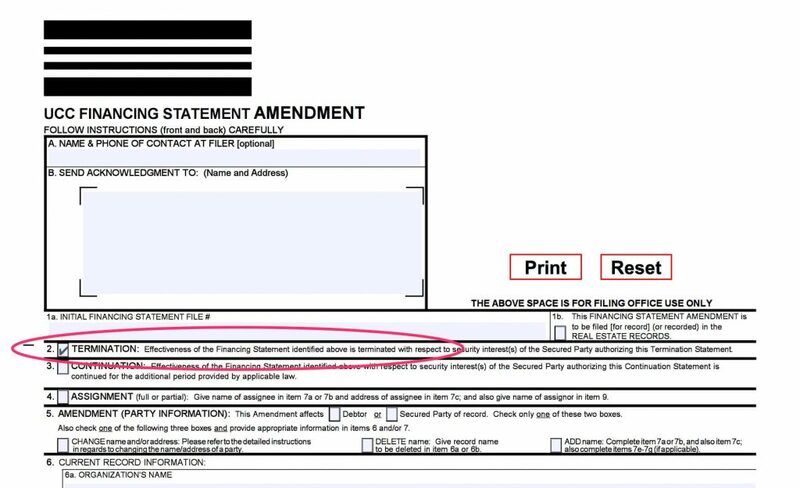 A UCC lien actually reserves a lender’s spot in line to claim an asset. That means if you file for bankruptcy or default, the lender with the UCC lien has the first right to claim whatever assets are covered under the lien. 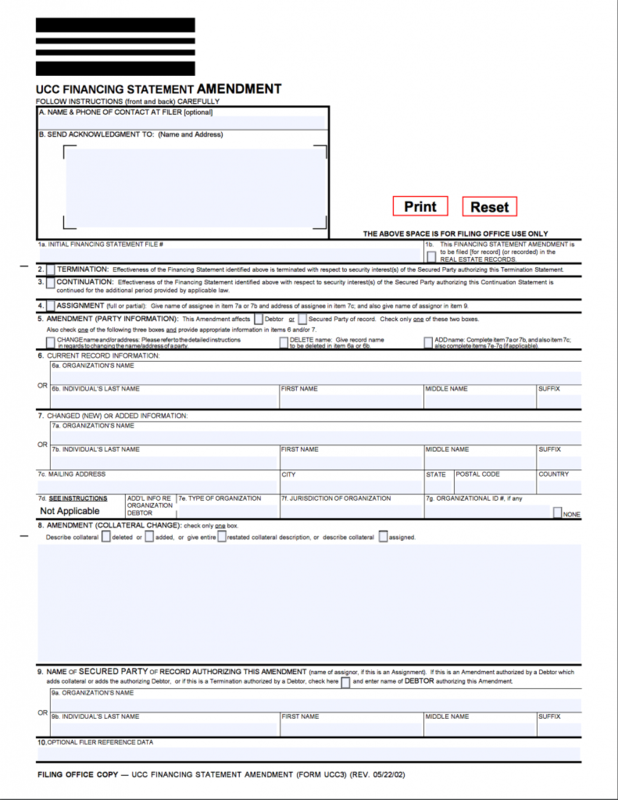 How is a UCC lien filed? A UCC lien is filed when you have received some type of business loan or financing. Depending on the type of funding your business has received the language and security (collateral) on the UCC filing statement will vary. Many unsecured business loans companies will file a blanket lien on business assets. This loan is still considered unsecured because it can not penetrate the corporate veil and go after personal assets in the event of default. That UCC-1 then creates a lien against the business entity and one or more of the debtor’s assets to secure the amount the debtor borrowed. Debtor’s name: This can be either an organization (partnership, corporation, etc.) or individual (including sole proprietorships). What can lenders place liens on? Lenders can place a UCC lien on a variety of things. The easiest way to understand it is in connection with collateral, a more commonly understood element of the borrowing process. It’s important to note as well that a judgment creditor can extend beyond this and do things such as force the sale of certain business assets and take money from your bank accounts to settle the debt (in most cases, personal assets can’t be touched) through the election to perfect a judgment against a business who defaults. However, this is only allowed in the case of a judgment creditor, meaning the lender must have gone to court and proven the debt is theirs and that they have not been able to collect that debt. So, if you have every intention of paying your debts, that will never be a problem. Specific collateral lien: This type of lien uses a single asset as collateral (hence the name). Blanket lien: This type of lien “blanket” covers many different assets, all of which can be used to settle a debt in the same way as any other collateral. It’s important to know the difference because you may have a lien against a single asset or many different assets all at once from a single UCC lien. For example, if you need to obtain a business loan for some new equipment, but you know you have a UCC lien, it’s important to know which kind because that lien could be on a single asset, meaning you have other assets you could place down as collateral for that new loan, or it could be for several different assets, leaving you without any form of collateral. 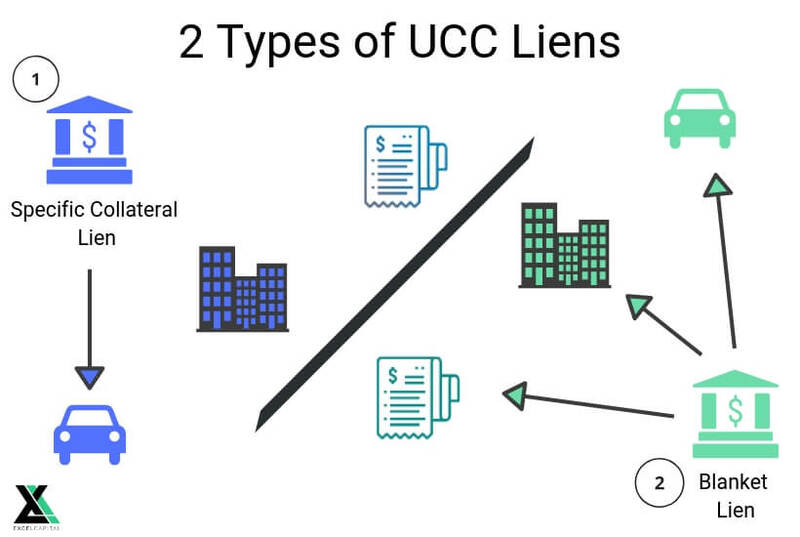 In addition to these two basic types of UCC liens, a lien can either be labeled a UCC-1 or UCC-3 filing type. UCC-1 is a standard UCC lien. Every new UCC lien is UCC-1 and stays that way until there is a change with the lien. We’ll touch on UCC-3 filings more, later as they play an important role in helping you removing a UCC filing. How can a UCC filing affect your business? Generally, a UCC filing has no real negative impact on your business. However, a UCC lien can still affect your business in a few ways, so it’s important to know how. The most significant impact a UCC filing can have on your business is connected with its very purpose: because a lender already has a lien on all or some of your possible collateral, it will likely be hard– if not impossible– to obtain any kind of secured financing from a lender. Many traditional banks and institutions that offer business loans and lines of credit like to come in 1st position. This means that they do not want any other outstanding debt ahead of them. If you have an outstanding loan that has a UCC filed against the business the bank will want it paid off before extending capital or will only offer you bad credit business loan options. There are still unsecured business loan options which don’t depend on collateral. Therefore, no UCC lien is filed. However, secured loan options require hard collateral such as property, bills, or vehicles. So if you have none to put up– or if a new lender would have to sit 2nd in place behind another lender to claim that collateral in case of a default or bankruptcy– you’re not likely to be approved. Due to this, it’s important to check to make sure you don’t have a UCC filings already– or that a previous lien has been removed– before applying for funding again. A UCC lien filing remains on your business credit report for 5 years. This has no negative effect on your credit score, however, when someone checks your credit report it is visible and that can play a factor in your ability to be approved for things other than just business funding. That typically isn’t the case, however, it should be kept in mind. While you should already be aware of the collateral you put down when applying for funding, it’s important to know if a lender will be placing a UCC lien on your assets and what type of lien it will be (blanket or specific collateral and what asset if it’s the latter). If you don’t already know this, you need to inform yourself so you’re aware of what the lien is covering and when it will drop off your credit report. While we’re on the topic of knowing whether you have a UCC filing on your business credit report or not, let’s talk about how to check if you have one. First, keep in mind that while the points we just talked about in the previous section should be understood, none are really anything to worry about and are more a byproduct of the regular business of things. In other words, there’s nothing to worry about by finding a UCC filing on your credit report. If you’ve borrowed recently and the loan was secured, you likely already know what was put down as collateral. However, if you have an old loan that you’ve since paid off, you might still have that lien on your report and can get it removed (assuming you did pay it off), so the first step is to find out if it’s still there. Every state has a way to search for UCC filings done within that state. 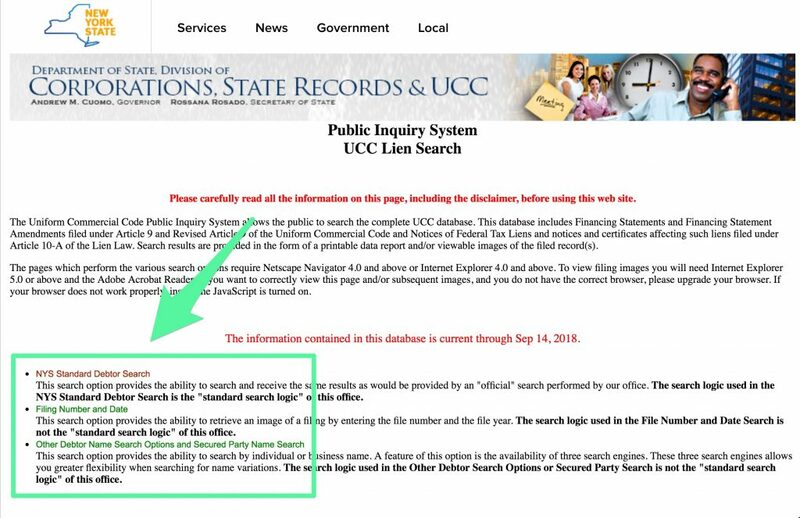 So, you can visit your state government’s official website to search their database to find your UCC lien information. However, don’t worry, we’re not going to make you do all the work to find your state’s database. We’ve done that work for you. First, by clicking on the drop-down menu above and selecting “New York”, you’re taken to the page below. Once there, click on the relevant search under the “e-Filing” section at the top left. Once you’ve entered your information, your UCC lien information will be displayed. Keep in mind that every state’s UCC lien search is different. 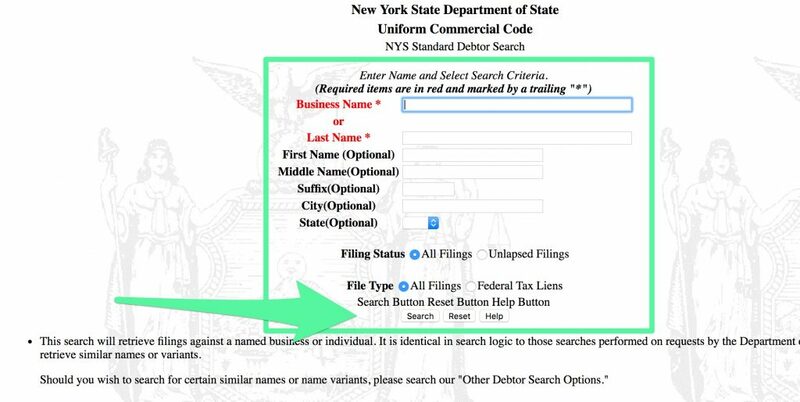 In addition to this, while some states, such as New York and Florida, offer the ability to search for UCC filing information for free while other states charge a fee. Getting your business credit report is the second of two primary ways you can find out if you have a UCC filing. There are just a few websites you can use to obtain your business credit report. Unlike your personal credit report, which offers free methods for obtaining your report, you may have to pay for your business one. However, these sites generally offer valuable credit watch services which are worth looking into in themselves if you want to stay on top of your business credit. 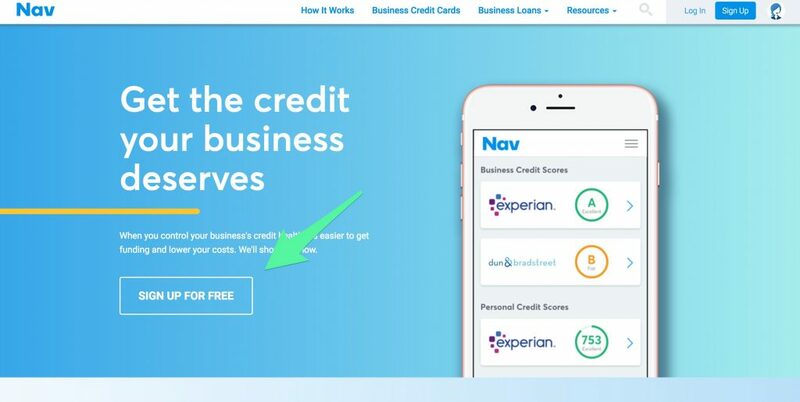 Nav is one of the best options for obtaining your business credit report because they allow you to obtain reports from multiple bureaus for free in some cases. Second, now that you’ve submitted your basic information you’ll be asked to enter your social security number and birthday and finally answer a collection of security questions based on your credit history. Once you’ve completed the steps, you can then check over your credit report for the UCC filing information. UCC filings are automatically removed from your credit report after 5 years. That’s helpful. However, because of this lenders don’t tend to file lien releases unless a borrower specifically requests the lender do so. That means if you’ve paid a secured loan off over the past several years, you may still have a UCC filing on your credit which shouldn’t be there. So, how do you get it removed? The steps are pretty straightforward. So, let’s talk about that now. First, you must have paid off the debt. That might sound obvious but it needs to be mentioned. If you currently have a balance on your secured loan with a UCC lien on one or more of your assets, you can’t get that UCC filing removed. Second, contact your lender. The only real step to removing a UCC lien is to call your lender up– assuming your loan is repaid– and request the UCC filing be amended (i.e. removed). However, if you don’t have your lender’s contact information, use the steps we mentioned earlier to obtain your credit report. Your credit report will have your lender’s contact info. This isn’t something you have to bother with on your end if you’re the borrower, but it’s important to know how it works and what the lender’s job is to remove your lien (and what it means if you see UCC-3 on your lien information in your state’s database). Once you request your lender remove your UCC lien, they should provide you with confirmation that the UCC-3 termination has been filed. When you accept the terms a lender proposes to you, it’s important to understand that you’re accepting an agreement that may require a UCC lien be placed on one or more of your assets. Therefore, a UCC filing is a normal part of the borrowing process and not generally something bad or unexpected. There are some drawbacks to having a UCC filing, such as the increased difficulty in obtaining additional funding, but those drawbacks are few and reasonable as they pertain to the law (after all, we need economic balance). However, if you have a UCC filing that can and should be removed, and you’re in need of obtaining financing, make sure to take the proper steps to remove that lien so you’re free to obtain the funds your business needs when you need it.